Retro Sonic Nexus is an effort by "The Taxman" (Christian Whitehead), "Slingerland" (Brad Flick) and "Hunter Bridges". It is a merger between three separate fan-games, Retro Sonic, Sonic XG, and Sonic Nexus. Sonic XG is the dominant fangame in the merger, and the levels from Retro Sonic and Sonic Nexus were adapted to the XG style and added to XG's levels. This would've been the first game to now go by the more universal Retro Engine, instead of the Retro-Sonic Engine that was used in previous demos. According to various sources, due to other major projects (including the 2011 version of Sonic CD), this project has been cancelled and Sonic XG was leaved as a standalone fangame again. By the other hand, most of the soundtrack done for the project (as well Sonic Nexus) can be heard on Hunty's official Soundcloud account. 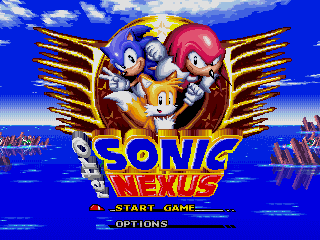 - Before merging the game with Sonic Nexus, the game was going by Retro Sonic XG. An attempt to port over Sonic XG to the then named Retro-Sonic Engine whilst incorporating some levels featured in Retro Sonic (Like Robotic Resort, a revamped version of Egg Garden). -According to some lines of text found hidden inside the 2008 demo of Sonic Nexus, it is believed that Retro Sonic Nexus was already being worked on or at least have been in planning stages during that time period. This page was last edited on 4 April 2019, at 22:44.